Home For The Holidays: Follow Me Thomas Giveaway CLOSED! My little man love Thomas and Friends! From the first time he had seen the commercial on TV for the Follow Me Thomas, he has insisted that he had to have him! So when I was given one, courtesy of Fisher-Price to review for my readers, I was just thrilled! The Follow Me Thomas follows the light from the lantern that he comes with. He can go in circles, zig zags, figure 8’s that are programmed patterns! I know that this is going to make a great present this year for my little man, and the Follow Me Thomas will make a great present for any little man this holiday season or for any reason!!! Lead Thomas on his way! When you point and move the light from the lantern Thomas follows along. Press the lantern’s buttons for programmed moves including a circle, figure 8 and zigzag patterns. Hear engine sounds and phrases as Thomas chugs along! Not only was I given a Follow Me Thomas as a wonderful holiday treat for my little guy, but the people from Fisher-Price would like to give one of my awesome readers a holiday treat to share with the little guy in their life who would love to have a Follow Me Thomas this year!! 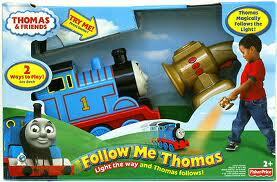 Fisher-Price will be giving one lucky reader a Follow Me Thomas of their own for the holidays!! What other Fisher-Price product will you be getting for the little ones in your life this year? Please leave your email with this entry! This giveaway is open to US residents. This giveaway will end at midnight on December 8,2010. Winner will be chosen at random.org and will be given 48 hours before another winner will be chosen. All products for reviews and giveaways are given as a sample from the companies. All opinions in reviews I conduct are my own. I was not paid to say anthing or review any products. Previous Post Home For The Holidays: Aurora YooHoo and Friends Giveaway CLOSED! http://realmomreviews.blogspot.com/Following your blog!Please follow back! Thanks for jumping on the Train. Have a great week! A new follower.My little guy wants all things tools, like the Handy manny tool box! We are getting the mailbox from FP! We got my son, who is a huge Thomas the Tank Engine fan the "Tidmouth Sheds" Take & Play train set with the Turntable for Christmas. He told his grandmother that this is all he wanted for Christmas. Follow on Google Friend Connect, and I think I may have hit the button twice for Tweeting my first time of 12-2-10. It was because I tried to hit cancel before my comment went through because I wanted to add that I also followed you on Twitter. Sorry. Blog comment #1http://followmethomastoygiveaway.blogspot.com/2010/12/follow-me-thomas-toy-giveaway.htmlThere two, there four, there six, there eight.Shunting trucks are hauling freight…. #2 Blog commenthttp://followmethomastoygiveaway.blogspot.com/2010/12/follow-me-thomas-toy-giveaway.htmlRed, and Green and brown and blue.They're the really useful crew.All with different roles to playAround Tidmouth Sheds or far away.Round the hill and down the bends.Thomas and his friends. Blog #3 Commenthttp://followmethomastoygiveaway.blogspot.com/2010/12/follow-me-thomas-toy-giveaway.htmlThomas he's the cheeky one.James is vain but lots of fun.Percy pulls the mail on time.Gordon thunders down the line…..
#5 Blog Commenthttp://followmethomastoygiveaway.blogspot.com/2010/12/follow-me-thomas-toy-giveaway.htmlMy kids love singing that song. It is a request of theirs before they go to sleep too. The SmartCycle looks pretty cool! Not sure if I voted correctly on Top Mommy Blogs, does it mean liking it on Facebook? Is that voting? I hope I did it right!Anyway…I think that I successfully voted!Thanks for a great giveaway. My son adores Thomas! I follow you on FB and I love this Thomas the toy! My boyfriends son would love this for christmas we also got him Geo Tracks.